What does it take to change? Creativity, catalysts, craving, community, control? The letter “c” seems to incorporate many or most parameters for technical, social, and artistic development, no other letter could have provided a better thematic structure for the festival’s multiple ways of finding answers or asking new questions about change. Ascott doesn’t use softer words like impulse or idea, he uses force, including a certain aggression, leaving no doubt that art can really make the difference. There was one work among the many pieces that were to be discovered in Linz, which for me had the same emphasis, a similar strength. Even though on the surface it seemed quiet, nearly peaceful. It was the four channel video installation called Realm of Reverberations by the Taiwanese video artist Chieh-Jen Chen. Realm of Reverberations grasps change in all its agony, showing the complex and desperate emptiness caused by it over time. 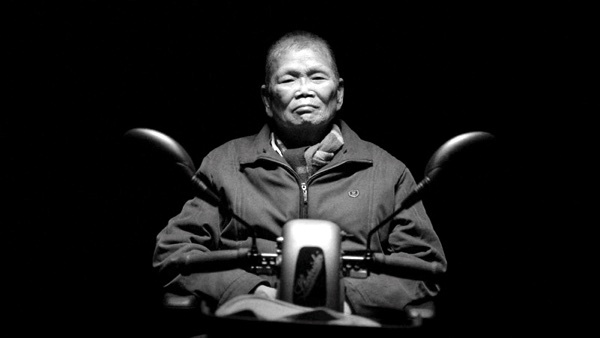 The black and white videos show interviews and silent shots of different people who live and lived in Taipei in the Losheng Sanatorium, a nursery home for people with Hansen’s disease. Built in the 30s to isolate those suffering and keep them away from society against their will, it became over the decades a home, a world for its inhabitants – having lost their connections to their former environment where they weren’t allowed to be anymore. In 1994 the Taipei Department of Rapid Transit Systems decided to move their train depot to the Xinzhuang District, to the property occupied by the Losheng Sanatorium. The construction work started in 2004, the remaining residents were supposed to be relocated. Having been arrested their whole life, the patients were now supposed to leave the buildings, making way for the construction site. But where should they go? Twice in their life an existential change was forced onto them – first they had to leave their families and live encapsulated in the nursery home. Now their former prison is being taken from them, a prison that has become their home. The installation shows the sanatorium’s buildings already abandoned, the inhabitants, a former nurse, a woman who visits the patients and a fictional political prisoner. It is a poetic documentary about the history and fate of the Losheng Sanatorium, but also a general portrait of those who are not in power and thus can’t chose the change, but have to suffer from its consequences. C for condemned. From a transdisciplinary point of view I’d argue that change is not only the ideal consequence of art, but always an inner motor to produce a piece of art in the first place: c for construction of self. Kafka doesn’t want, as he notes, to write about himself, but he wants to investigate himself through writing, like a doctor investigates a patent, like a substance is examined in a laboratory. In German ”untersuchen” consists of ”unter” (under) and ”suchen” (search), it implies to look for something under the surface. What Kafka expects to find are elements or parts (”Bestandteile”) he doesn’t describe any further, maybe we can call them truths, memories, impressions. Elements that can be connected to other elements, merging into a new substance or matter. In the end these elements construct the one who is investigating. ”From this I will built myself up again”, noted Kafka, he strives for a stabilization through re-narration. In German “aufbauen” has, besides the constructional aspect, also the notion of encouraging someone emotionally. Kafka wants to stand on safe ground, regarding his personality and history, he wants to create a functioning environment. The newly built narration becomes a shelter, becomes the actual home of the person it is told about. For me the vibrant energy of this quotation is the aspect of re-narration, of re-construction the own or collective history through art. In my reading the ”aufbauen”, the building/encouraging through artistic investigation, is full of hope. No irrational, naïve hope, but a very reflected, constructivist hope. It includes the belief that we have a sovereignty of and responsibility for our own (personal and collective) story. Maybe we can say, what it takes to change in an artistic point of view is the re- : the belief in re-construction and re-narrating as a precondition for the c.